Entry-to-Practice Competencies for Nursing Care of the Childbearing Family for Baccalaureate Programs in Nursing - Canadian Association of Schools of Nursing / Association canadienne des écoles de sciences infirmières (CASN / ACESI). 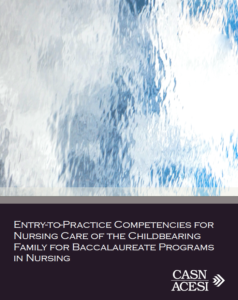 In 2016, the Canadian Association of Schools of Nursing (CASN) developed national, consensus-based entry-to-practice competencies for nursing care of the childbearing family for baccalaureate programs in nursing. These core competencies are related to the nursing care of childbearing families that all baccalaureate nursing students in Canada should acquire over the course of their undergraduate education. The purpose of the competencies is to provide direction for nurse educators teaching in nursing education programs and for curriculum development. The competencies with their accompanying indicators delineate the set of knowledge, skills, and attitudes that all new nursing graduates should possess related to care of this population, regardless of the specialty area of nursing in which they may elect to practice, while also ensuring that they have the foundation needed to work in perinatal or related areas of nursing. The competency development included a multi-step, iterative process, involving relevant stakeholders from across Canada. Details about the methodology used can be found in the competency document.